Made this for a friend. She breastfed all of her children and currently breastfeeding her new baby. I admire her passion to breastfeed all her children full-termed (say about 2 years). Wishing her "Happy Breastfeeding", gal! And the best part was the serunding daging that Ayu sent me! So, thanks to Ayu, dapat makan nasi impit dengan serunding daging for Eid this year. Thanks to Ayu and Dayang for their business and entry on Spinningspool-Shoppe. 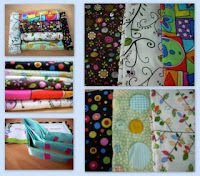 Wish my other great customer - Ms Dura <-- who bought like 20 sewing patterns (oh yes!she sews alot! 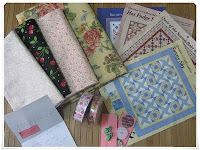 ;p) and fabrics from me have a blog too. (read : Dura, I'm writing this to inspire you to create your own blog!). So far, all parcels have arrived safely to the respective customers - credit to USPS and Pos Malaysia for this too. And to those who is still waiting for the parcel to come, "Insya Allah, parcel akan sampai soon. :)"
Ihya Ramadhan and Happy Fasting people! Got these pictures in my email this morning. It's the picture of the maternity dresses I made for my SIL and herself in those dresses. I send it to her from here and it took about 8 days to get to JB. Not bad at all. Someone asked me, what can you do with FQ? In my humble opinion, you can make more than 2 tudung lids with 1 FQ (measurement for FQ = 18"x21"). All of my tudung lids or generally known as "awning"/ atap are made from 100% cotton FQ. I found that cotton fabrics are amazingly suitable to make the "awning"/atap for this kind of tudung. Those were ordered by a friend for her eldest daugher. All "awnings"/atap for the tudungs (except for the last one on the right) are made from 100% cotton FQ. And of course, there are other things that you can actually do with FQ. This is just an example. The Spinningspool Shoppe Merdeka Giveaway..!! I've been neglecting this blog and I see this giveaway thingy as my chance to 'revive' it. Anyway, check out my other blog - The Spinningspool Shoppe Merdeka giveaway. There's many WoW! goodies in it. I'm almost there ---- there where? Almost at my giveaway. Woot...wooot! !